Canine Cushing’s disease is one of the three common endocrine diseases that tend to affect older dogs. (The other two diseases are diabetes and hypothyroidism). Of the three diseases, Cushing’s disease is the most difficult one to treat. 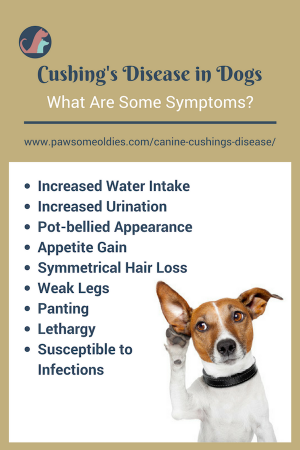 Did you know that every year in the United States, about 100,000 dogs receive the diagnosis of Cushing’s disease? Among these dogs, a majority of them are middle-aged and old dogs. So I wanted to write a detailed post on this disease – a dog parents’ guide if you will. I will cover natural remedies and diet for canine Cushing’s disease in a separate post. The medical name of Cushing’s disease is hyperadrenocorticism (but honestly who wants to use such a long and tongue-twisting name?). It is a disorder that causes the adrenal glands to overproduce corticosteroids (stress hormones). The pituitary gland, which is located just below the brain, controls the production of corticosteroids by the adrenal glands. When the pituitary gland thinks the body needs more stress hormones, it releases a hormone called ACTH, which acts as a signal telling the adrenal glands to produce more corticosteroids. A tumor in one or both of the adrenal glands (this type of Cushing’s is known as adrenal-dependent Cushing’s, or”ADH”). Pituitary-dependent Cushing’s is more common. About 85 percent of the cases of canine Cushing’s are PDC cases. The remaining 15 percent of the cases are adrenal-dependent Cushing’s. Tumors that occur in the pituitary and adrenal glands are usually adenomas, which grow slowly, don’t spread, and are non-cancerous and non-life-threatening. A dog with Cushing’s disease tends to have a pot belly for several reasons. First, Cushing’s causes a dog to retain fluids in the body. It also causes the liver to enlarge. Finally, excessive cortisone hormones weaken muscles and ligaments. All these result in the dog having a pot-bellied appearance. 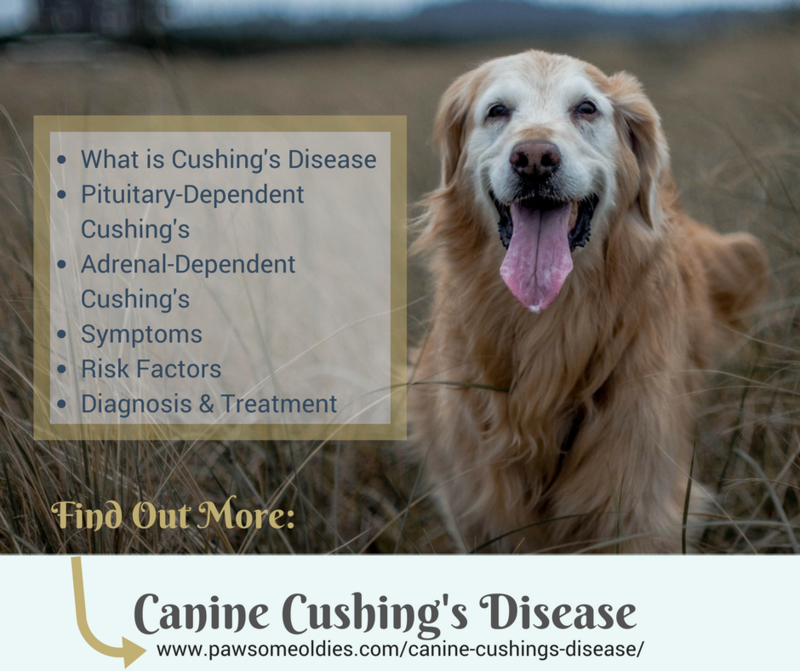 Also, if Cushing’s is caused by a tumor in the pituitary gland, and the tumor is larger than 10 mm (called a “macro-tumor”), the dog may show some neurological symptoms, such as confusion, blindness, incoordination, seizures, etc. As you can see, many of the above symptoms by themselves are not too specific, but taken together (e.g. increased urination, plus increased appetite, pot belly and hair loss) may give you a clearer picture that the dog may have Cushing’s disease. So if you first notice your dog is drinking and peeing more, be more observant and always on the lookout for combinations of other signs and symptoms. Cushing’s disease tends to occur in older dogs. The average age at diagnosis with pituitary-dependent Cushing’s is around 10 years old, and with adrenal-dependent Cushing’s around 11-12 years old. 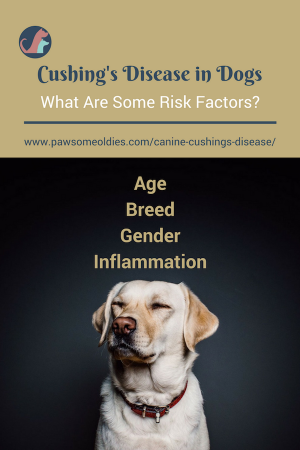 For some reason, female dogs are more susceptible to Cushing’s disease. To reach a proper diagnosis, the vet will most likely first look at all the symptoms, and then run some routine tests (blood work and urinalysis) to rule out other possible issues, such as kidney disease, diabetes, etc. An elevated blood alkaline phosphatase (ALP, ALKP) level. Liver enzymes (including ALT) may be elevated. An increased number of neutrophils. A lowered level of thyroid T4 hormone. An increased blood sugar level. Protein may be found in the urine. X-ray may show an enlarged live, and sometimes calcium deposits can be seen in the skin, the kidneys and the adrenal glands. How to treat Cushing’s disease in dogs depends on various factors, such as how serious the symptoms are, and which type of Cushing’s the dog has. Some vets and dog parents choose not to give medical treatment if the dog shows minimal symptoms – you will understand why if you look at the side effects of the drugs! Four drugs available for treatment of canine Cushing’s disease are: Mitotane (Lysodren®), Trilostane (Vetoryl®), Ketoconazole (Nizoral®), and L-Deprenyl (Anipryl®). Mitotane is a chemotherapy drug, but can also treat both pituitary- and adrenal-dependent Cushing’s. It is rather inexpensive. The first 7-14 days of this drug treatment is the “induction” phase, and usually the drug is given twice a day. Remember to always give the drug together with food (preferably fatty food), otherwise drug absorption will be poor. BUT Mitotane can cause serious side effects rather commonly. 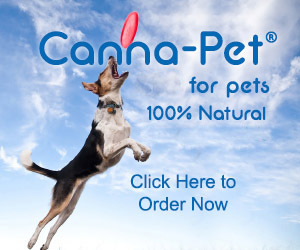 If your dog is on this drug, be sure to observe him very closely. Side effects include appetite loss, vomiting, diarrhea, listlessness, and incoordination. The side effects are the result of a rapid big drop in the dog’s cortisol levels (that means drug dosage is too high), which can be detrimental. In such a case, the dog needs an “antidote” of prednisone tablets and the side effects should go away within 30 minutes to 2 hours. As you can see, how much to dose is very important and each dog is of course different. Dogs on this drug should have regular blood tests, so the vet can monitor possible adrenal damage and adjust dosage if necessary. This drug can also treat both pituitary and adrenal-dependent Cushing’s. But dogs with kidney or liver disease should not use it. Trilostane should be given twice a day with food. Though considered safer than Mitotane, Trilostane can still cause side effects, such as vomiting, diarrhea, lethargy, appetite loss, and listlessness. But the symptoms usually go away if the drug dosage is reduced. If your dog cannot tolerate Mitotane, you may consider switching to Trilostane. To be safe, be sure to wait for at least one month after stopping Mitotane before starting Trilostane. Like Mitotane, if your dog is on Trilostane, he should get blood tests on a regular basis. One big negative factor of Trilostane is cost. It is more expensive and since it must be given more frequently, it could run up the medical bill quite quickly. You may recognize the name Anipryl® if your oldie has canine cognitive dysfunction. Yes – it is a drug that vets use to treat doggie Alzheimer’s. It turns out that this drug can also treat a certain type of Cushing’s – pituitary-dependent Cushing’s. The upside of Anipryl is that it has much fewer (and less detrimental) side effects. Only about 5 percent of dogs show such side effects as tummy upset, restlessness, or occasional hearing problems. The downside is that only about 20 to 40 percent of dogs with Cushing’s respond positively to the drug. But hey, if your dog can’t tolerate both Mitotane and Trilostane, it doesn’t hurt to give this drug a try. This is actually an anti-fungal drug that has the side effect of suppressing adrenal hormones. It’s not the first choice to treat Cushing’s for most vets but is used sometimes as a last resort. It works on about 50 percent of dogs with Cushing’s but the effect tends to be mild and not permanent. Side effects of this drug may include vomiting and diarrhea, which usually go away with lower dosage. You’ll probably agree that all of the above four drugs are far from perfect. So, are there any non-drug treatment for canine Cushing’s disease? If a dog’s Cushing’s disease is caused by a tumor in one of the adrenal glands, then theoretically the vet could remove that gland, right? Most dogs diagnosed with Cushing’s are oldies and may not be able to recover well after the surgery. If the tumor is in the pituitary gland, it used to be considered inoperable due to the location of the gland (just below the brain). But several years ago, VCA West Los Angeles Animal Hospital started using a surgical procedure to remove pituitary “macro-tumors” with the help of an exoscope (called a VITOM). The surgery is rather non-invasive because it only involves making a small hole in the back of the mouth to enter the skull at the base of the brain and remove the tumor. I contacted the Hospital today (January 9, 2018) and found out that unfortunately they no longer perform this procedure. Instead, they recommended Washington State University Veterinary Teaching Hospital. Further treatment (with drugs) is necessary because radiation itself doesn’t eliminate symptoms of Cushing’s other than the neurological ones. If you want to explore using alternative natural treatments (e.g. 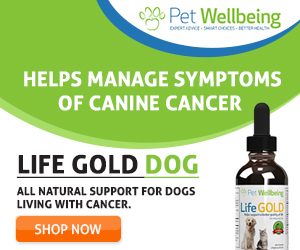 herbs, supplements, and diet) to help your dog with Cushing’s disease, visit this post for more information. Also go to this post to grab a yummy treat recipe for dogs with Cushing’s!